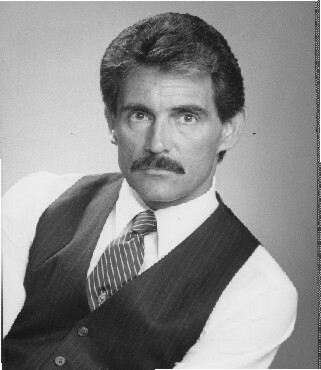 Bob Benson, Atlanta Ga. - I had a rotator cuff tear and cold not lift my hand above my shoulder for a month. I thought I would try listen to this reprogramming CD for a few days, and suddenly it felt like I was taking a heavy drug. No pain! I thought this cannot be, but it was for real! I never believed in mental reprogramming or whatever this is, all I know is my shoulder feels better each morning. This stuff is amazing, I think I'll try the non-smoking CD. Jerry Lambuth, Decatur, Ill. - I would have never tried this in a million years if my wife had not purchased it for me. I wouldn't even use it or listen to it for 2 weeks until she locked me in a room and made me listen to it once just to start with. Suddenly my twisted knee quit hurting, and it didn't crack when I walked. My body began to heal itself at an alarming rate and I didn't miss the pain I have for the last 12 years. Now I truly believe in the mind as director of the body, and by the way, I feel great, and have even started golfing again! 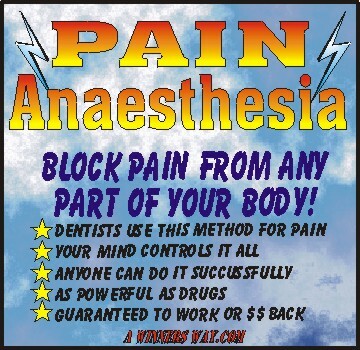 PAIN ANAESTHESIA - Your MIND controls it all! There have been documented cases in which someone under Hypnosis has been told that a red hot poker has touched the surface of their skin. In reality it was just an ice cube. In just seconds an actual blister arose from the exact spot that was touched by the ice cube. The inner or subconscious mind is a super powerful instrument in shaping the reality of our lives, and this is just one of the examples. There have been other countless cases of people actually stopping the flow of blood from a severe cut, by Hypnosis, and this was induced OVER THE PHONE. So if these feats were possible, is it not possible that you can block pain from your mind too? 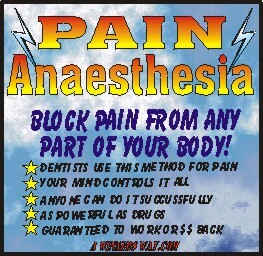 Many centers for the education of Hypnotherapy are featuring a course in pain anesthesia for dentists, because it affords them a new way of blocking the pain of drilling, oral surgery, and just gives their patients a new option of a more effective, and less evasive way of block the pain. At first it may seem ridiculous to patients that their mind can do as good a job as Novocain or gas, but when they first try it and it works they are amazed at how effective it can be. Very simply put, pain is the tramatization of nerves in your body. What do nerves actually do? They send messages to the brain about how your body feels, sometimes good, sometimes not so good. Pain is just the way God gave us to know when there is something wrong with our body, somewhere, anywhere. You get a pain in your elbow after playing a lot of tennis, you got "Tennis elbow". The same for all your joints, especially when you get older. All you have to do is block the pain message to your brain, and although the pain is still there, the nerves are still irritated, but you don't FEEL it, because the message is not getting to your brain. Pills, like Motrin, Aspirin, Vicodin, all do only one thing. Block (some) of the pain message, or irritation of the nerves in the affected area, from sending that message to your brain. Its been said that "Mind over matter" is the way to train your mind to do anything. Tell that to someone who has just sliced their finger cutting a bagel, but it's true. To illustrate, imagine you have a splitting headache, and you're sitting in a room with one chair, no furniture, just you, and the door opens and in rushes a 300 lb. African Lion, roaring and starts to charge you. Suddenly you don't have a headache any more. Why? Your mind is on something else, the pain message is overridden, and you focus on the Lion, which in your view is a bigger problem that your headache. It may seem like a crazy analogy, but it is the truth. So how do you shift your mind to other than the pain that's bothering you? That's what this CD is all about, is taking you to a place...mentally...which is very open to new commands and suggestions, and when these new commands replace the values, and truths you now have about the pain that's making your life less than fulfilling, the pain messages are blocked from getting to the brain. The nerves are still being irritated, but the message is not making it all the way to your brain. It's hard to believe but remember the blister that appeared on the skin of the hypnosis subject mentioned earlier. The blister was real, because of the belief behind it was real. On the reverse side if it was an actual red hot poker, and the subject was told it was an ice cube it most likely would not have a problem at all. How do people walk across hot coals in the "Fire walking" seminars? The MIND controls it all. It also implants commands in your subconscious mind to cause you to begin to relax, and de-materialize the pain message, and begin to feel comfort instead of the pain you were previously feeling.